There was a palpable rush of adrenaline Thursday evening in Asbury University’s Hamman-Ray Science Center as math majors pressed download at precisely 5 p.m. to begin the annual Consortium for Mathematics & Its Applications (COMAP) Mathematical Contest in Modeling (MCM). The competition served as the grand finale to Math Week, a celebration of the programs within the Mathematics Department that highlighted the ways in which students can use the skills they’ve learned at Asbury in their future careers. Asbury Math majors have participated in the international math modeling competition for more than 30 years. Teams of three undergraduate students work together to model solutions to real-world mathematics problems during the competition each winter. Students were hard at work on this year’s problems from Thursday evening to Monday evening. Reid Matheison ’21, competing for the second year in a row, thoroughly enjoys the camaraderie and fun during the research process as well as the academic challenge. “Math modeling is a great opportunity for us to apply the things we have learned to real situations ranging from data analysis to developing policy that could possibly be actually adopted,” Matheison said. In addition to the competition, the Math Department hosted a Math & Literature Discussion, put on as a special collaboration with the English Department. The discussion took place in Kinlaw Library and included Crowe Johnson, Professor Kristina Erny, Dr. Chuck Gobin, Dr. Erin Penner and Dr. Dan Strait. For Crowe Johnson, the cross-department collaborations are especially exciting because they serve as a learning experience for not only the departments involved, but for all of campus, as many people do not immediately see how the disciplines connect. Also, during Math Week, the Admissions Office hosted prospective students for a STEM Visit Event. 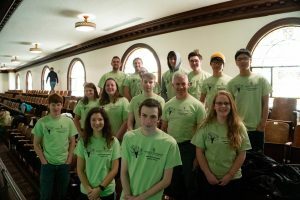 High school students were able to explore their future Asbury home, attend science and mathematics classes, and had the opportunity to observe current students during the math modeling competition. Matheison notes that while the week is math-focused, students of all majors are welcome to partake in Math Week events and encourages them to do so in the future. “I know that the competition is mostly sold to the math majors but, there are really parts of many studies included and students who major in many of the sciences would be more than welcome to join us next year,” Matheison said. Learn more about the Mathematics Department at Asbury.